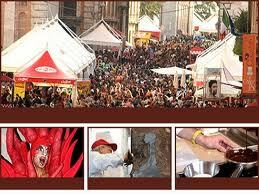 Eurochocolate is today one of the most important events in Perugia. Eurochocolate is the most popular festivals in Italy and followed by everyone who is mad about chocolate. Born in 1994, this festival has started thanks to the effort of Perugina (a well-known Italian brand now owned by Nestlé), a leading manufacturer of chocolate in Italy and worldwide. The events take place in the streets and in the squares of the medieval town: for eight days, Perugia becomes so frentic and alive, thanks to the chocolate events, the open air laboratories and tasting sessions of chocolates and wine. Eurochocolate was also known as ” the festival of delicious, unique and diverse”, as the most prestigious Italian and foreign confectionery present their products on this occasion. Brands such as Lindt, Nestle, Caffarel are in this festival. During the week are many the stands where skilled craftsmen will make giants made of chocolate! So a reign of chocolate confectionery’s sculptures will wait for you!!! The very last days of the festival they are going to be destroyed but no worries! All the pieces are going not in the bin, but in your greedy mouth, cause they will be distributed to all. Confectioners and chefs fight together and create dishes made of chocolate, widely experimenting with new flavours for the starters and main dishes. During Eurochocolate the old town of Perugia rises the visitors’ presence up to thousands among Italian and foreign tourists, so if you wish to visit the event and the beautiful Perugia, try to go especially on weekdays, in order to avoid problems of crowding!!! The chocolate is the real star and many visitors just come here to taste loads of gorgeous and yummy specialities. But Eurochocolate is also culture: it shows also debates and workshops in order to go deeper in the world of chocolate. This entry was posted on Saturday, October 15th, 2011 at 3:28 pm	and is filed under Events in Italy. You can follow any responses to this entry through the RSS 2.0 feed. You can leave a response, or trackback from your own site.